Find which allergy eye drops you should use with contact lenses and where to buy them. The most common allergy that affects the eyes is called seasonal allergic conjunctivitis, in other words, the eye's reaction to spring pollen, If you suffer from hay fever, chances are you also get that dreaded itchy feeling when the buds start to sprout on trees. Here in Cyprus, things get particularly bad when the olive and citrus trees are in flower. The aroma from the blossoms itself can be overpowering, the eyes start to water and once you've started to rub your eyes, you can't stop! While liquid eye washes like Optrex can help ease the itching and eye redness, you have to take your lenses out for it to have the best effect and then wait 15 minutes before you can put them back in again. When you don't have time to take lenses out, allergy eye drops are the solution, but you need to make sure they are compatible with your contact lenses and any solutions you use. NB: Optrex make Allergy Eyes eye drops just for hayfever sufferers or those who get asthma or pet allergies. BUT you can't use them when wearing your contact lenses. The problem with contact lenses if you suffer from allergies is that it can become impossible to continue wearing your lenses if your eyes are watering too much. You won't be able to see through the lenses properly as they'll be covered with salt residue from the excess tears being produced and your eyes may itch so much, the lenses themselves become uncomfortable. One solution is to try daily disposable lenses for a couple of months as any excess deposits on the lenses wil disappear when they go in the bin at the end of the day. Or just accept that you may have to wear eye glasses during the peak of the pollen season. Otherwise, try some eye drops specially made with antihistamines for allergies. Here are the best eye drops for allergies I've found on the internet. 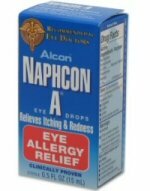 Naphcon A eye drops are one of the very few allergy eye drops you can use while still wearing your contact lenses. They used to be available on prescription only but can now be bought over the counter and are recommended by opticians and opthamologists for relief from eye redness. They contain an antihistamine to relieve soreness from allergies caused by pollen, grass and animal hair and are so gentle, they can be used just like rewetting drops to relieve allergy symptoms even while you have your lenses in. 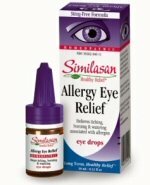 Similasan Allergy Eye Relief is a homeopathic-based product that offers soothing relief from itchiness and red eye. It has a sting-free formula and won't discolor your contact lenses BUT you must get an eye health-check with your eye doctor before using these drops. Some opticians will let you put them in without removing contact lenses; others will say you need to take them out first - it all depends on how sensitive your eyes are and the contact lens solution you currently use. 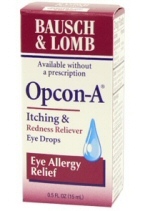 Opcon A Eye Allergy relief, made by Bausch and Lomb, eases mild symptoms of itchiness and red eyes but only temporarily. It contains an antihistamine to soften the effects of pink eye and is available without a prescription, but should only be used a maximum 4 times per day. These allergy eye drops unfortunately cannot be used while wearing your contact lenses so remember to take them out first. They can be used by adults and kids of six years and above.